When you hire us to take care of your Texas pest problem, you get quality service – guaranteed. 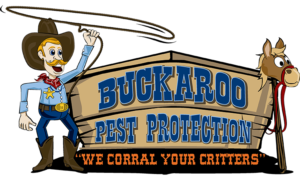 Just like the relentless determinism that characterized the American frontier, when you work with Buckaroo Pest Protection, you work with a company that will keep at it until the problem is solved. We offer a wide variety of pest control services, including prevention and removal of many different common insect, rodent, and wildlife infestations. During your first call, we’ll immediately schedule a time to have one of our trained and licensed technicians to visit your home or business and conduct an inspection. They’ll go through your home and look around to find the pests themselves, areas they’ve built nests, as well as any obvious locations where they could be entering your home from. After the initial inspection, they’ll be able to identify the exact type of critter that has made its unwelcome home on your property. Proper identification allows for more exact, effective control. Once the pest has been identified along with any specific problem areas where it has built nests, the pest professional will diagnose the degree of your problem and evaluate what the next steps will be to not just remove your existing pest problem but to prevent future ones as well. We’ve already said that our specific approach is all about getting in and out in the least intrusive manner possible. We won’t bug you non-stop, but we will work with you to ensure you have a customized maintenance plan and knowledge to help you implement pest-prevention practices in your daily life. We want to create a non-appealing environment for pests without compromising safety and comfort in your home. When your problem has been identified and you have been given the educational materials to help prevent future problems, the next step is determining the best way to address your current problem and keep it resolved. We use environmentally friendly integrated pest management techniques that will help keep you and your family safe – and we’ll lay out the options available to you based on the pest found, the severity of infestation, and timelines for removal. At this point we’ll implement the plan we’ve agreed upon and document the entire process including findings and any potential chemical applications, so you can file it away in case you ever need the information again. Once all the previous steps have been done your home will be pest free, you will be equipped with the knowledge and best practices to prevent future infestations, and we’ll be out of your hair after setting up any auto-scheduling for future maintenance. Want to know more? You can lasso up some information about different types of pests we protect against or just schedule a service today.